Today you may feel the need to reach out and lend a “helping hand” to someone. The Six of Pentacles is all about benevolence — giving what you can afford to give: whether it’s your time, your money or your energy — to someone who needs it more than you. In this version of the card we see the mirror images of a positive and negative (or black and white) set of hands. 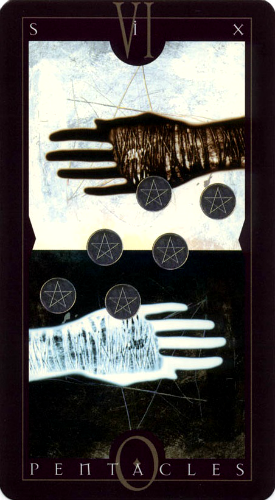 Six coins (pentacles) are spread across the images, also in perfect harmony. As stark as the imagery in this card is, the message is still very clear. Along with the obvious first impression: “one hand washing the other,” there’s an implicit understanding that everything we put out there comes back to us eventually, in one way or another other. Money is only one form of energy. And yet most of us struggle trying to balance the value we place on it with the value we place on all other forms. 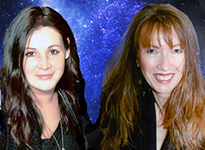 We think mainly of money when we think about giving — but with Mercury and Chiron in sextile today, you can bet that the thing that matters most turns out not to be a “thing” at all. It’s more likely to be words of encouragement, validation and support. Mercury rules communications, words and the expression of ideas. Chiron is all about comforting, healing and self-sacrifice. Put them together in a benevolent aspect like a sextile, and you have the perfect recipe for putting your own needs aside long enough to tend to or comfort another. The Six of Pentacles serves as a reminder to pay attention to (and be grateful for) the blessings that you receive. You may find yourself loosening your purse strings after all, or you may find yourself the recipient of someone else’s good will. Either way, it’s all about appreciating the pathways between giving and receiving, to the extent that there are no expectations for being repaid. The Six of Pentacles encourages you to give because you can and because the gratitude you receive in exchange is more than enough reward in the end. Today’s tarotscope — the Six of Pentacles — is part of the Vertigo Tarot series, by prolific artist Dave McKean, author Rachel Pollack and with the introduction by Neil Gaiman, for whom Dave McKean has extensively collaborated with. The Vertigo Tarot is a DC Comics limited edition retail product based on the Vertigo comic series and has been re-released in a manufactured to order Vertigo Tarot Deck Set 20th Anniversary Edition .